Flann O'Brien. AT SWIM TWO BIRDS.Longmans, London 1939. TRIVIA. O'' Brien's novel 'The Third Policeman' was featured in the October 5, 2005 episode of the hit television series 'Lost'. At one point during the episode (entitled "Orientation"), a copy of the book can be seen. The episode concerns the main characters' discovery of a mechanism which they are told must be reset at every 108 minutes by entering the numbers (4 8 15 16 23 42), or else "the world will be destroyed." The series' creators have said that anyone who has read the book "will have a lot more ammunition when dissecting plotlines" of the show. The book has seen a significant sales increase since its role in 'Lost'. In our Charing Cross shop almost every day someone asks for it (we often have a copy) - other visitors also ask the way to the Soho pub 'The Rusty Cauldron', which doesn't exist outside of Harry Potter - however there is a rather camp pub called the Duke of York, known to some of its waggish punters as 'The Rusty Cauldron' and we occasionally send them there. 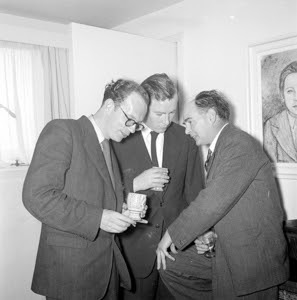 Our picture below shows Anthony Cronin, John Ryan and Flann O'Brien (right with knee raised--possibly showing it to Cronin who created 'Dr. Finlay') on Bloomsday, Michael Scott's house, Sandycove, Co. Dublin 1940s. Q. 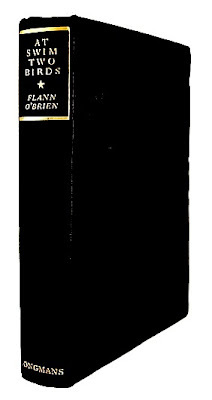 Who is Flann O'Brien? Q. Who is Brian Nolan? Q. What did these three men do? A. They wrote three books called "At Swim-Two-Birds."